Doug’s Five Minute, Five Hour, Five Bean Chili makes me think of something Mulan told Belle in the series “Once Upon a Time” convincing her that she could kill a scary monster. This is clearly one of those times where Mr. Spinach Tiger wanted something badly enough. You see, I’m not a chili fan. I have made many bean soups and much white bean chicken chili, but not the kind he likes. He is like most people in the world, at least in America, as he can’t go through a winter without having a huge pot of it on the stove at least once. He wanted it. He learned to make it so well that his five minute, five hour five bean chile has totally won me over. Yesterday I decided to pay attention to what he did. Right in the beginning I was in disagreement. Why so many different beans? Why not cook the onion first. Why an orange bell pepper? (Of course, being a smart wife, I kept my why’s to myself). He had well thought out answers for my questions. The onion needs to melt into the chili on its own. The orange bell pepper lends sweetness. He spoke like an expert, and I was satisfied. This chili is creamy due to the masa he sprinkled in and the long long cooking time. He cooked it for 7 hours, but says five hours is enough to get that creamy consistency. The meat mixture was interesting, The pork and beef added flavor, and the turkey helped to cut the fat. The orange bell pepper was sweet and the dash of cinnamon was genius. The prep time is really five minutes, if you can chop fast. There is almost no hard work outside of opening several cans. Usually, Spinach Tiger doesn’t cook from too many cans, and one could make this with dried beans, but that would take a long time and is not necessary. It’s a matter of weighing out the decision to use dry beans as a purist, or the interest of five different kinds. I choose the five. You can put it all in a crock pot or in a cast iron dutch oven. He made two batches and did both. If you do use a cast iron dutch oven, I recommend a heat of 300 or even less in the oven, so the heat is hitting evenly. If you keep the dutch oven on the stove, turn the heat to as low as you can get it. I did a little bit of googling and was intrigued with chili history. An entire book or two could be written about the history of chili, the legends, the myths and the abundant number of recipes. I can’t think of a food in America that has drummed up more passion for it’s history or its varying recipes as a bowl of chili. I imagine there have been many fights, even a few knock outs over recipes and ownership. The most debated fact about chile is where and how it exactly originated. It is thought to most likely have started in Texas amongst poor people who had tough pieces of meat that needed flavor and long cooking times. There was no beans at first, and in some circles, beans are still not used. The cowboys heading west gave speed and romance to its popularity. Chili was often made and perfected in prison. As prisoners got out, they missed the chili and would write for the recipe. Some even rated prisons according to their chili. There were chili queens in San Antonio, who broke the barriers of class. They would set up chili stands and cook meat and chili peppers into a stew. People of all walks of life would sit next to each other eating a bowl of chili. As far as the recipe, Doug makes it differently every time. He says that every new pot of chili is an experiment. That’s how chili making goes. He has used all ground beef in the past, but decided on three meats this time. He has used only two or three different beans in the past, but has settled upon five kinds. There are as many chili recipes as the cooks making them, actually more, because every chili cook has several recipes they use. That’s the beauty of chili making. He suggests always using the masa, plenty of onion, and cooking a long long time. 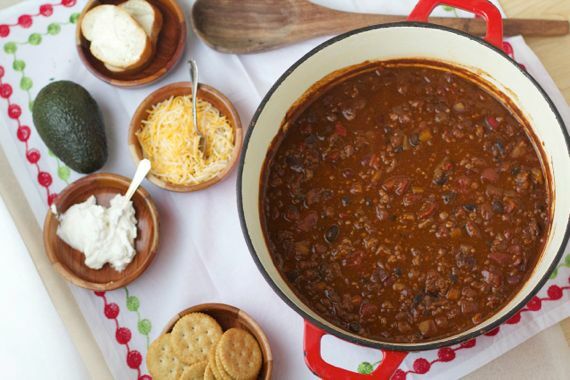 There are two other important topics when it comes to chili. How hot and what bread or cracker do you have to have. 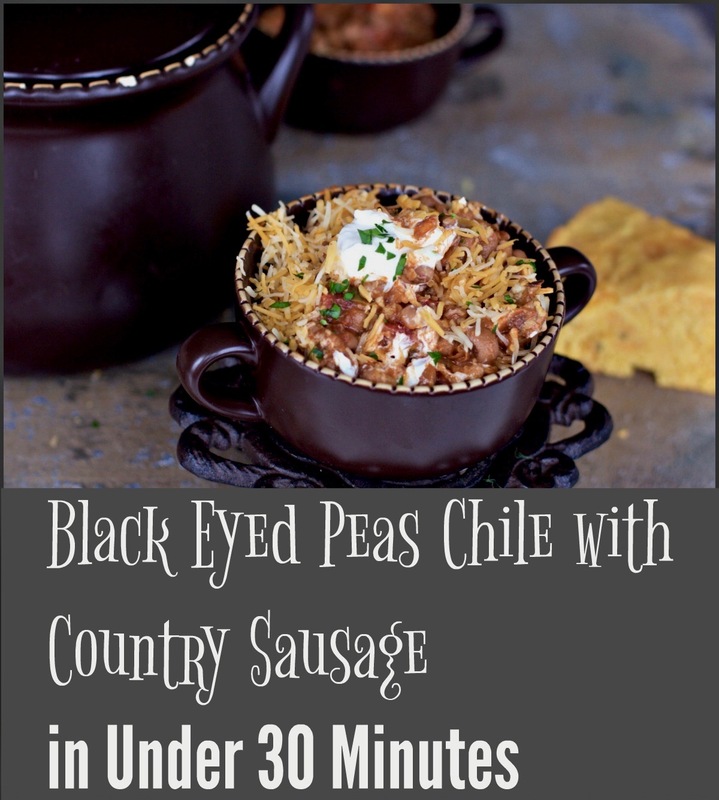 We have two new chili recipes for you, one is a 30-minute black eyed peas and sausage chili and one is a paloe, keto friendy bean free chili! So tell me, do you have a special chili recipe, and do you like it mild, medium or super hot? 5 Bean, 3 meat chili with a few special ingredients, resulting in perfect creamy blend of meat, heat and beans. Season meat with salt and pepper. Brown the meat. in small pieces in frying pan. Maintain the fat of the meat. This will add flavor! Rinse the beans with water to reduce the sodium; however you can put the cans in as is with the juice. Put in crock pot. Add tomatoes, peppers, onion and seasonings, except the masa. If you don't use a chili starter kit, use the spice ingredients that followed. Taste and adjust to your own liking. Sprinkle the masa after the chili has cooked for 2 hours. Continue to cook in low setting of crock pot for 5 more hours. Note: It's not necessary to cook the chili this long, but cook the chili at least four hours. Serve with grated cheddar cheese and sour cream, if desired. 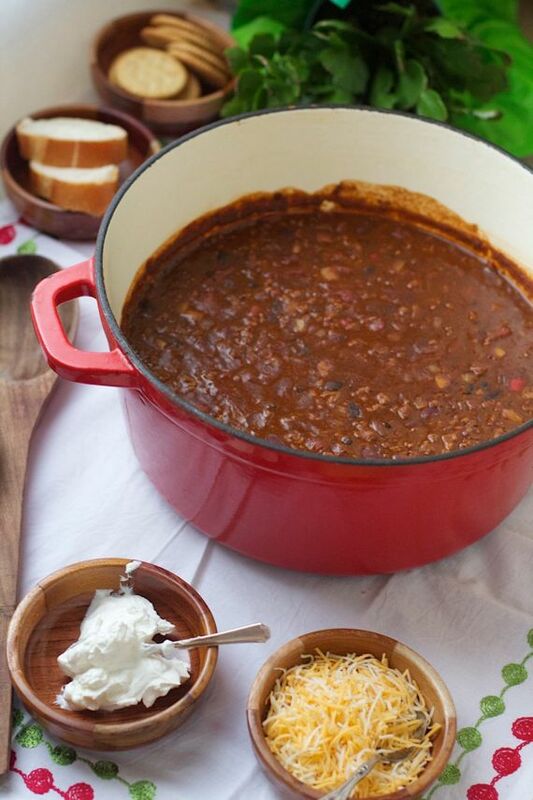 I find this chili so rich due to the masa, that sour cream isn't necessary. Note on beans: You need the to use kidney beans and black beans, but feel free to mix your beans as you please. I’m not sure what you mean by the description. In your narrative about the chili – you mention how the turkey cuts down on the fat. But I don’t see turkey in the ingredients. you also mention how there are three meats, but I’m only seeing beef and pork…? Angela, making this today, looks perfect for a cold day! What kind of chili pepper do you (I mean Doug!) use? Whole Foods has 10+ kinds, my son nice enough to go shopping for me, but he needs specifics. Also, 28 oz diced tomatoes ok? Also, I have masa harina, hope that’s good for the masa. Thanks to you and Doug for sharing! Another point of contention when it comes to chili is whether to add beans or not. For us, chili must have beans. Otherwise, it’s basically sloppy joe in a pot! Anyways, there are some great things going on in here–raw onions, masa, cooking for 7 hours. Wowza! Yes, I meant to add that in about the beans. We MUST have the beans! My foodie friend who joined us for dinner is still bragging about the chili. Chili queens?! Who knew! Looks like a delicious recipe- thanks for sharing! The chili queens were eventually shut down, reinstated and then shut down again. Someone should start that tradition up. Maybe a chili queen truck! 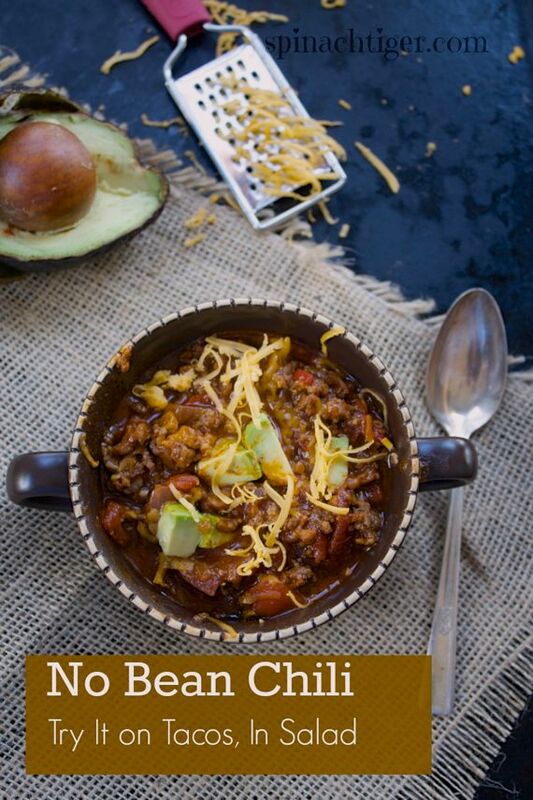 Oh yes to chili…I make mine with black beans and fire roasted tomatoes and toss in some of the Hatch chile peppers we roasted last fall as well as some cocoa….hardly ever any meat. I love chili and always have hot pepper sauces on hand to add after it is cooked. The Hatch chilies make it pretty hot. Great recipe Angela. Teresa, those hatch chilis sound like a great idea. It seems that good cooking runs in the family. A pot of chili does need to be on the stove at least once during these cold snaps.